Eco Blossom Nursery is a new online garden store based in Fort Worth that sells native and adapted plants. Photos courtesy of Eco Blossom. A Fort Worth woman is on a mission to save monarch butterflies, increase wildlife habitat, boost bird populations, reduce ocean pollution, feed bees and conserve resources - all while beautifying North Texas yards. Last month, Agnieszka "Anna" Hurst launched Eco Blossom Nursery, an online retail store for native and well-adapted perennials, shrubs, grasses, trees, vines and groundcovers that can stand up to the Texas climate. 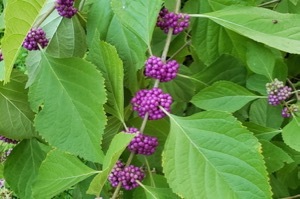 American Beautyberry is an understory shrub that does well in shade and provides food for wildlife. “I am passionate about native and well-adapted plants, and having worked in the landscape industry, I noticed when talking to clients, a need for wider, easier availability of these types of plants, as well as the need for more information on the subject,” Hurst says about her decision to launch the store. Eco Blossom is an offshoot of Hurst’s landscaping service, Happy Gardens, which has offered design, installation and maintenance of eco-friendly landscaping since 2008. Anna Hurst founder of Eco Blossom. Courtesy of Facebook. Hurst says her plant offerings such as Turk’s cap, rockrose, American beautyberry, Mexican plum trees, frogfruit and coral honeysuckle are not only beautiful but also easy to grow and require far fewer resources than conventional landscaping plants. They’re also almost impossible to find at most garden centers and big box home improvement stores. Buttonbush provides nectar for butterflies and fruit for birds. Also known as xeriscaping, using native plants and species that have native-like qualities such as drought tolerance has many benefits for both the homeowner and the ecosystem, says Hurst. Because native plants rarely need fertilizers, and may even suffer if fertilizers are applied, their use in landscapes helps to reduce the amount of nitrogen and phosphorous laden pollution that works its way through rivers and ultimately to the ocean where it leads to a poisonous algae bloom along the coast known as red tide. They also do a better job of retaining rainwater after a storm and keeping it from running off and overburdening stormwater drainage systems. They instantly increase the habitat for wildlife, providing host plants for butterflies and moths, berries for birds, nesting sites for babies and nectar throughout the season for pollinators.  She said native Texas plants have developed survival techniques, and that means they do not need a lot. 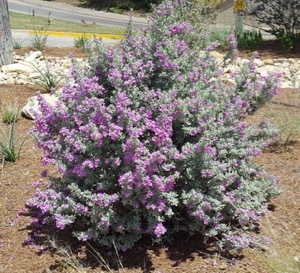 Texas sage provides nectar to insects and cover for nesting sites. 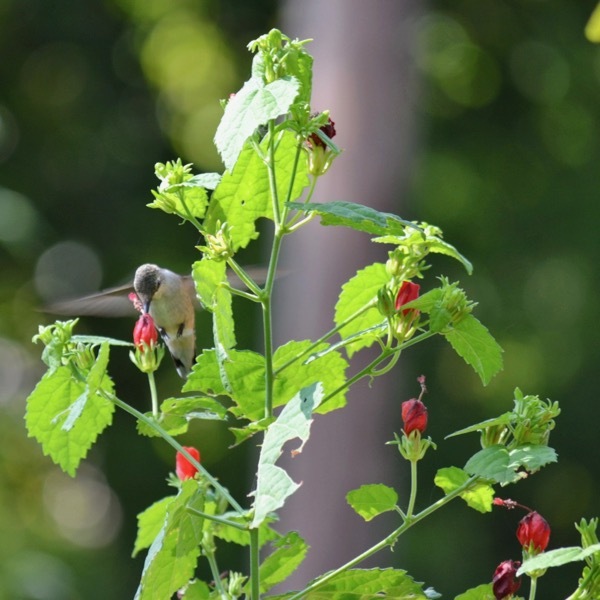 The Eco Blossom Nursery website is filled with images of each plant and offers general information about growing conditions and suggested uses, such as which plants do well for groundcover or erosion control along with what keeps the hummingbirds well-fed and happy. Her plants are free from systemic insecticides such as the bee-killing neonicotinoids that contaminate the offerings at most chain retail garden centers. “Currently, we deliver in the Fort Worth area, and you can check if we deliver to your zip code by adding an item to the cart. We do not offer pick up right now but are considering this as an option in the future,” Hurst says. Additionally, Hurst has pledged a percentage of each purchase to the local nonprofits her customers nominate to receive the donation. Turk's cap provides nectar for hummingbirds and butterflies. 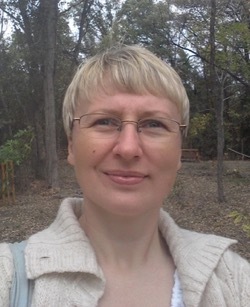 A native of Poland who says her thick accent reveals that she herself is a well-adapted transplant to North Texas, Hurst moved to the area 14 years ago and now calls Fort Worth her home. She said her love of plants, wildlife and all things natural goes back to her early childhood. “Ever since I remember, I gardened organically and was naturally leaning towards natives. I love their diversity. I love how versatile they are and how much they provide. I wanted my garden to be so much more than just a selection of static plants. With natives, the garden becomes alive. Wildlife thrives, mini ecosystems are created, and there is nothing better than watching all this life outside. It is so entertaining,” she says.